Each year in mid-October, the U.S. and Canada both observe National Fire Prevention Week with a goal of recognizing the dangers posed by fires and emphasizing the importance of fire prevention and preparation. 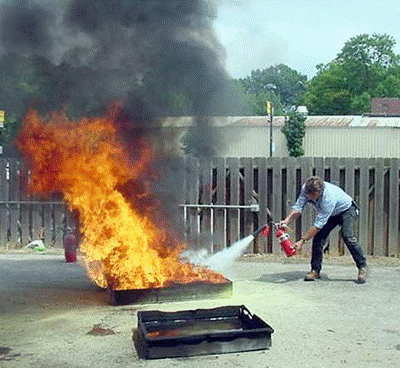 Here’s some information on something we have seen in movies or on TV, but rarely talk about in our everyday lives: how and when to use a fire extinguisher. We all recognize the iconic red containers, fire extinguishers, hanging on the walls in various places around our offices, jobsites and other public buildings. But do you know how and when to use one? How do you decide to fight a fire with one of these or when to pull the fire alarm, exit a building and wait for help? First, you should always pull the fire alarm to alert others to the presence of a fire and call 911. Also, do not try to use an extinguisher if you have not been properly trained. The goal for anyone dealing with a fire is to get yourself and others out safely. Help anyone you can without putting yourself in danger and exit the building. 1.) Verify that the fire is small, contained and not spreading rapidly. Fires can easily double in size in less than 3 minutes. 2.) Confirm that you have the proper extinguisher to put out the fire. This depends on the nature of the fire. Different fuels create different fires and require different types of fire extinguishers, but some types of fire extinguishing agents can be used on more than one class of fire. Extinguishers have a label indicating which type of that they can be used on. Class B fires are fires in flammable liquids such as gasoline, grease, lacquers, oil or paint. Class B fires do not include fires involving cooking oils and grease. Class C fires involve electrical equipment such as appliances, fuse boxes, wiring or energized electrical equipment. 3.) Check that the fire won’t block your exit if you can’t extinguish or control it. Sweep slowly from side to side at the base of the fire until it is out. Watch the area. If the fire re-ignites, aim, squeeze and sweep again. Safety, when understood and practiced correctly, is not an accident. Safety is a plan with built-in procedures to avoid or address accidents quickly with a goal of protecting our greatest resource, our people.